In the three representative oil-producing countries below, gasoline prices are subsidized - to the point that gasoline costs $0.12 per gallon in Caracas. Compare the growth in oil consumption in those countries to growth for the world as a whole. Do you see a pattern? The world has two kinds of energy-consuming jurisdictions: Those which respond to the price of oil, and those which don’t. In this post, I want to help define which is which. 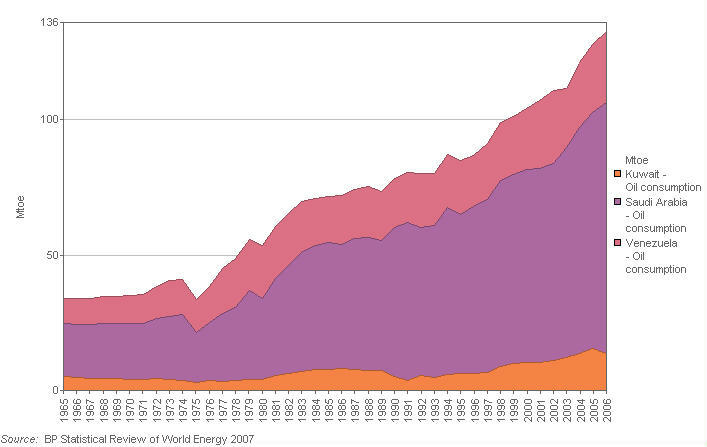 I also want to offer a few explanations why dramatic increases in energy prices have not yet damaged the world economy. These are intimately related issues. I recently had an interview with Marcel Coutu, the chair of Syncrude – the world’s largest oil sands plant. Syncrude has now been in operation for 30 years, and it has gone through a great deal of debottlenecking and expansion. It now produces 350,000 barrels of light, synthetic oil per day. I asked Marcel for his thoughts on peak oil, and he gave me a few comments that summarize things precisely. All OPEC can now do is raise prices by cutting production,” he said. “They cannot lower prices by increasing production because they don’t have the capacity. We are in a very pure free market situation, with prices being set by supply and demand. When I look at that dynamic, I have stopped worrying about the demand side. No matter how much the US goes into recession, for any period that is important to any of us, any decline in consumption there will be offset by increased demand elsewhere – in China and India, but also in developing countries that produce their own crude oil. Those countries generally subsidize oil products, and subsidies accelerate demand growth. He didn’t seem to think this was a major global problem, and I wish I had asked why not. Three Theories: Historically, rapid increases in oil prices have led to global recession. This certainly applies to the stagflation that influenced the decade after the energy crisis of 1973. The terrible recession of 1982-83 was without doubt related to the energy crisis of 1979-80. And the long, gradual boom that began after ’83 was closely tied to declining oil prices, including their collapse in 1986. What I think we need to ask ourselves is why high oil prices don’t seem to be doing a lot of damage to the global economy. According to The Economist, there are three possible explanations. Another explanation is that developed economies are more efficient in their use of energy, thanks partly to the increased importance of service industries and the diminished role of manufacturing. 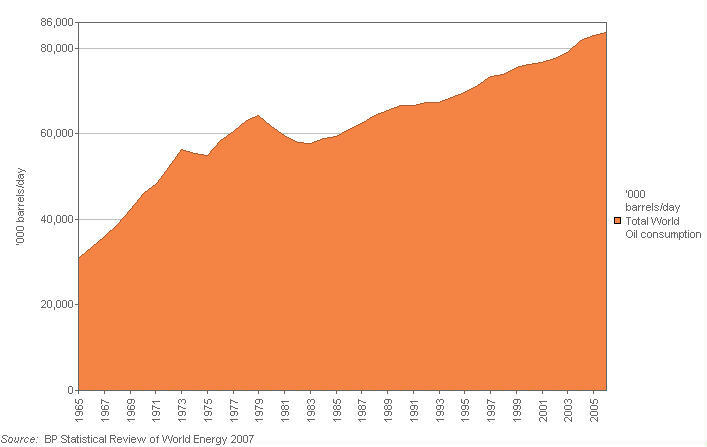 For example, the EIA has calculated that the energy intensity of America's GDP fell by 42% between 1980 and 2007. Another theory is that the oil-price rise has been steady, not sudden, giving the economy time to adjust. The Economist writes, “Giovanni Serio of Goldman Sachs points out that in 1973 there was a severe supply shock because of the oil embargo, when the world had to cope with 10-15% less crude almost overnight. Not this time.” It’s worth adding that during 1979-80, the percentage increases in oil prices were not as great as they were in the early 1970s, but in absolute terms the increases were greater by far. The Role of Emerging Economies: As Marcel Coutu explained at the beginning of this article, the most important factor for higher prices has been the shift toward greater consumption by developing economies. While the US, for example, has responded to high prices by cutting decline, slightly – according to one source, the decline will be 1.1% this year, such that American consumption next year will be no higher than it was in 2004 – demand from China and other emerging markets is more than offsetting this shortfall. With supply growth sluggish, the steady increase in demand is hauling prices remorselessly higher. It would take a recession in emerging markets to drive commodity prices substantially lower, and to date recession is not in the cards. A couple of points deserve comment here. One is that the achievements of Western nations in reducing energy intensity are nothing compared to the achievements of China. According to an excellent paper on China’s energy consumption and demand , since 1980 China’s energy intensity has dropped by about 75% – nearly twice the drop in the US. The reason is that in every way the country has become far more efficient. Of course, I am raising this point because it suggests a very deep irony: Exporting the world’s manufacturing sector to developing countries has not only enabled the West to become a more efficient energy consumer. It has also helped those countries to become more efficient. Don’t blame the Chinese, in other words: They are doing a far better job at using the world’s resources efficiently than the West can even imagine. A final thought – and this, too, refers back to Marcel Coutu’s earlier comment – is that the West is subsidizing inefficient energy consumption within oil exporting countries. Some of the cheapest gasoline prices in the world are in Saudi Arabia, Kuwait and Venezuela – the last being the all-out winner, with gasoline selling for $0.12 per gallon. The economies of these countries are not known for their gathering efficiency, yet the charts illustrate how much more dramatically oil consumption accelerates when prices are subsidized than when they are not. The plain truth is that western countries are subsidizing the inefficient consumption of oil in these countries because of the geographical reality that they have oil to export. Yet the countries we are most anxious about - China and India, for example - are the ones that are increasing their energy consumption not because of large subsidies, but because they are able to provide goods and services with greater energy efficiency than the rest of us.